Patients who suffer from Obsessive-Compulsive Disorder (OCD) have a rigid personality structure. Their lives are dominated by thoughts or actions, which are repetitive in nature. Those who have repetitive thoughts find that one particular thought will predominate at any one time and this will go round and round in their minds. This is referred to as “rumination” and it is extremely difficult for them to interrupt the cycle once it has begun. This means that the patient could spend a considerable period of time being involved in “rumination” thus preventing them from doing anything else. Those who perform repetitive actions often have a particular sequence that they must carry out in an exact order; this is referred to as a “ritual”. If this ritual is interfered with in any way, it may be necessary for the individual to start from the beginning once more. Rituals may take the form of, for example, repeatedly checking gas taps, water taps, plugs, the cooker or the locks on doors. These rituals may have to be repeated a number of times even though they have supposedly reassured them selves that all is well on the first occasion. Some patients will go so far as to repeatedly lock and unlock the door in order to make quite certain that it has been locked correctly often returning later to recheck this. Another manifestation of OCD is a terror of contamination. One person may be terrified of bacteria leading to obsessive hand washing all day and another might have a fear of radio activity which prevents the wearing of wrist watches and coming in to proximity with any clocks. OCD can present as an obsessional fear of vomiting, which may be closely linked with contamination and hand washing. These patients are terrified that they might vomit. In order to combat this they may cut out certain foods, because they are convinced that eating them will lead to vomiting. This may well lead to drastically restricting their diet to a very small number of “safe items”. In addition they may be frightened of other people vomiting, which may interfere with flying in an aeroplane or travelling by sea. It is frequently found that there is a high level of superstition associated with obsessional behaviour. Some may carry a piece of wood or some other object, which they touch frequently throughout the day in order to prevent them having “bad luck”. The severity of the OCD will determine how much the patient is able to do in life. The symptoms are very incapacitating and lead to an increase of fatigue. Instead of being able to live a normal life they are tormented by their symptoms. 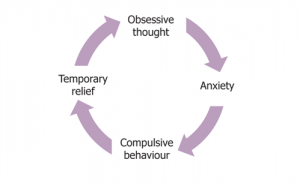 On the majority of patients who suffer from OCD do not tolerate hypnosis as a form of treatment as they feel that this will in some way interfere with the obsessional behaviour. However, there are a number of OCD sufferers who find hypnosis is very helpful as part of their treatment. Some patients find antidepressant medication helpful, but many OCD patients are highly resistant to the idea of taking any form of medication. In my experience the most effective form of treatment is individual psychotherapy over an extended period of time. The therapist should not exert any pressure on the patient and be completely non-directive. In this way the patient can experience complete freedom of expression, which has a liberating effect on their rigid way of functioning. The therapist needs to exercise extreme patience in allowing the patient to progress at his or her own pace, how ever slow that might be. As the treatment progresses the patient gains trust in the psychotherapist, and very slowly he or she is able to reduce the obsessional behaviour one step at a time.